And before you write – we know about OneNote, Evernote, Readability, etc. And those are great and sometimes they allow you to right-click on pages where right-click has been disabled. But the two free browser extensions below, make it easy to right-click and copy text from most pages that block right-click and copy. 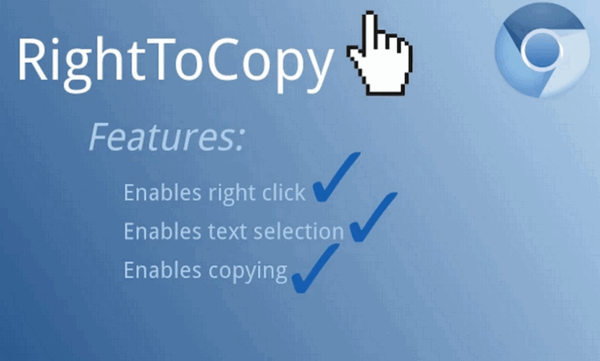 With the extensions installed, you should be able to right-click and copy from most web sites that block right-click and copy. One of these extensions is for Chrome and one is for Firefox…and the one for Firefox is more sophisticated, the one for Chrome works pretty well. You can get more information and/or get this Chrome extension from here. RightToClick protects from annoying alert pop-ups, can remove many timer actions and is able to suppress (unusual) click behavior. The highly sophisticated engine also offers options for fine tuning. Finally it’s helpful with image downloads (also disabling CSS might be useful here). You can read more about and/or get this Firefox extension (add-on) here. Happy right-clicking, but please don’t violate the intellectual property of others. I still use the snipping tool you brought to us many moons ago. This will make a nice addition. Thanks! Chrome is my default browser but I think I’m going to use the Firefox one …thanks. I’m back and forth between both of these during the day.